Kashmir University Date Sheet 2019 has been released. Students can check the University Of Kashmir Date Sheet from this page. The exam date, time, day, subject, faculty, and year/semester can be checked from Kasmir University Date Sheet. Kashmir University allows the eligible students to appear in the exam. The eligible students have to submit the online exam form along with the exam fees. The university will issue the admit card for all the eligible candidates. It is important to carry the admit card along with the valid ID card on the day of the exam. Check the page for Kashmir University Date Sheet 2019. Latest: Kashmir University has released revised Date Sheet for 2 Year B.Ed 3rd & 4th Semester Examination May 2019. 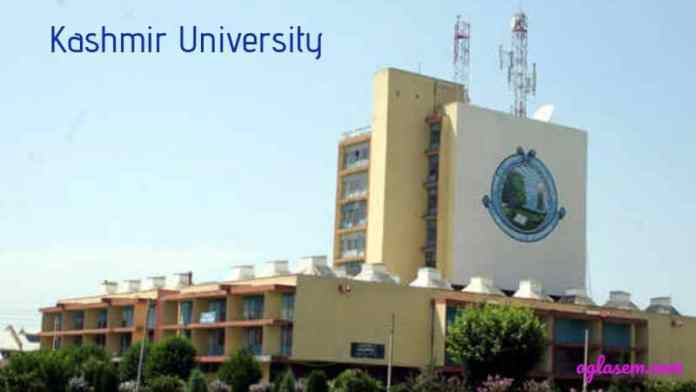 Also for Kashmir University Admit Card 2019 – Click Here. Kashmir University conducts the semester exam at the end of each semester. To appear in the exam students must fulfil the attendance criteria as per university norms. Students who are eligible to appear in the semester exam can check Kashmir University Date Sheet to know the exam schedules. It is also helpful in the preparation of the exam. Check the table for University of Kashmir 2018-19 Date Sheet. Date Sheet: Candidates can check Kashmir University Date Sheet 2019 from the official website ie, kashmiruniversity.net. How to check Kashmir University Date Sheet 2019? The university releases the date sheet for the convenience of the candidates. Candidates can use the date sheet to know the exam dates, time, and day for their courses and important notes. With the help of the date sheet, candidates can prepare for the exam. It is also helpful to know no days gap between the exam. Candidates must appear to the exam hall 30 minutes earlier to the commencement of the exam. Carry Admit Card along with the valid Identity card on each day of the exam for verification by the examiner. Kashmir University Admit Card is also addressed by Roll Number Slip. Candidates will be able to download the admit card from the university website after the centre notice is issued. Kashmir University Admit Card is the important document for appearing in the exam. No candidates shall be entertained without the admit card. The admit card holds the information of the candidate and the exam he/she appearing for. Candidates need to carry their admit card on each day of the exam. The University of Jammu and Kashmir University was established in 1948. The university was bifurcated into two full-fledged University: the University of Kashmir and the University of Jammu in the year 1969. Kasmir Univerity is located at Hazratbal in Srinagar. The university offers the programme in all the major faculties, Arts, Education, Business & Management Studies, Law, Applied Science & Technology, Social Sciences, Dentistry, Physical & Material Sciences, Biological Sciences, Oriental Learning, Engineering, Music and Fine arts.